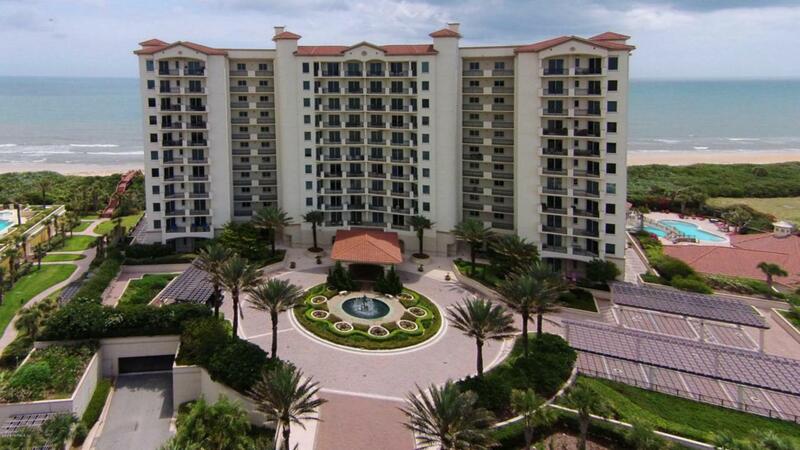 One of the most desirable oceanfront condos in Tuscany/Hammock Dunes. Ideal OPEN floor plan with 4 bedrooms and 3.5 baths. Great room, kitchen, dining room, master bedroom and office overlook the Atlantic Ocean. Private oceanfront balcony with ocean views. Volume ceilings with walls of glass and Spectacular Views. Gourmet kitchen where you can watch dolphins and whales play. Enjoy the Sunrise and Moon rise over the Atlantic Ocean and fall asleep watching the shrimp boats twinkle in the sea. Guest rooms overlook the lake and golf course and access the western balcony with incredible sunsets. Tuscany features luxury amenities with oceanfront fitness room, beach pool, spa, fire pit, summer kitchen, social room, sauna and steam and theater room.Membership to the private Hammock dunes Club is available but NOT required. HD Club is a "Designated Emerald Club of the World" and boasts 2 Audubon Certified Championship 18 hole golf courses, oceanfront clubhouse, fitness center, heated oceanfront pool & spa, tennis, croquet, etc. Enjoy gourmet or casual dining at two clubhouses, ocean terraces or poolside. The Creek Course has recently been ranked in the "Top 100 Residential Courses" in the nation. Ranked #1 Readers Choice Award for Best Private Club in the Southeast by Orlando style magazine! Hammock Dunes is ideally located between Orlando and Jacksonville with easy access to I-95 and airports in Jacksonville, Orlando or Daytona Beach.